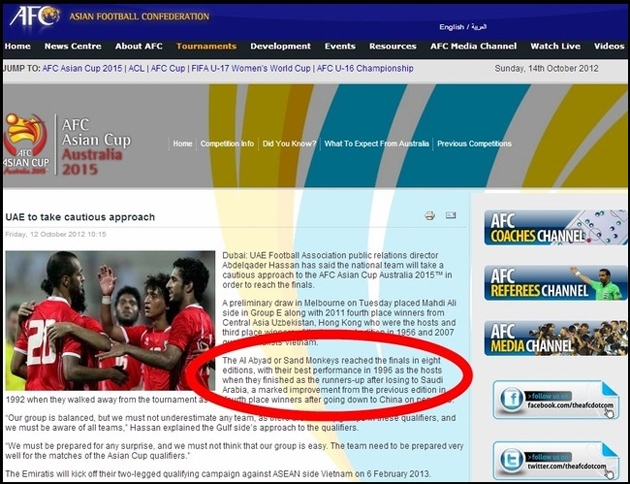 Last Friday the official Asian Football Confederation website published an article about the United Arab Emirates national team and its quest to qualify for the 2015 AFC Asian Cup. The title of the article was "UAE to take cautious approach," which is a modus operandi the author should have applied to his or her own writing, after referring to the team as "Sand Monkeys." The distasteful racist nickname ended up in the article as the writer causally gleaned the term from the world's leading source of misinformation for journalists, Wikipedia. The AFC apologises for an editorial mistake in which the UAE National Team was inadvertently referred to by an inaccurate nickname on the AFC's official website www.the-afc.com in the article 'UAE to take cautious approach' dated 12 October 2012. The error, which was mainly because of referral to a popular web-based encyclopedia by the concerned Editor, was corrected immediately after it was noticed. The AFC would like to apologise for any hurt this might have caused to the UAE Football Association and UAE football fans. The offending term has been removed from the AFC site and the UAE national team Wikipedia page, and the new writer has probably been instructed to stop saying racist things. The UAE national team is actually known as "Al-Abyad," or the whites, thanks to the color of their uniform.